All transactions are safe and secure with a reliable history in online purchasing behind each of our associates. Buy the Tyler's Sock it to Me Fight Club t-shirt to own Fight Club clothing and merchandise. 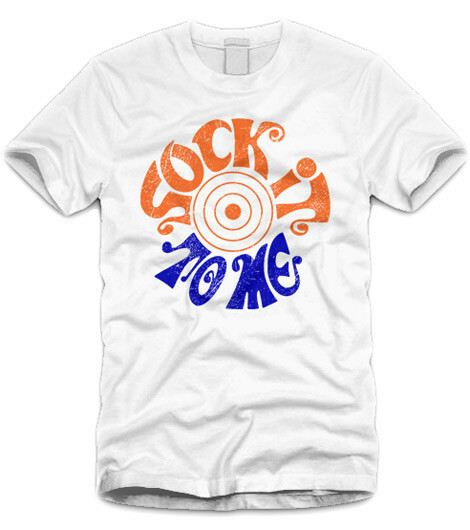 This vintage Sock it to Me design is worn by Brad Pitt's character, Tyler Durden, in the Fight Club movie. The orange and blue retro style logo has a slightly worn look to give it a more rugged appearance. Whether you're in the mood for a stroll along Paper Street, or you plan on becoming a member of Tyler Durden's Project Mayhem, this Fight Club t-shirt will keep you in style no matter what you're doing. Tell your friends that your soap salesman friend Tyler lent it to you. In addition to the Tyler's Sock it to Me Fight Club tee above, browse the Fight Club Clothing Gallery for more apparel like men's and women's clothes, kids shirts or hoodies.